Plot Outline: When mankind is about to come to an end, a group of scientists decide to create and populate a city deep underground. 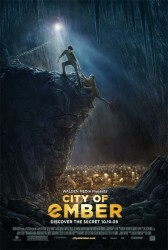 The city of Ember is to last for 200 years after which its inhabitants are to retrieve from a strong box instructions to return to the surface. Over time however, the message is lost and life in Ember is rapidly deteriorating. Their power supply is failing and food is being rationed. It's left to two young adults to unearth the secret of Ember and to lead the way out.